(APN) ATLANTA — Plans are underway to restore historic Mims Park, on Atlanta’s West side in the Vine City community, to its original design by world renowned landscape Architects Frederick Law Olmsted and John Charles Olmsted. The restored Mims Park will memorialize and honor legends of the Civil Rights Movement with statues, but another legacy that is interwoven in the park’s history is causing controversy. In the late 19th century, the park was donated and named after Atlanta’s 37th Mayor, Livingston Mims, who also fought on the side of the Confederate States of America, against the United States. It was Mims’s service as a Confederate officer that is causing the controversy with vocal objections to him being memorialized in the park. “While everyone else is taking down civil war statutes, we are trying to put another one up. It seem the people who designed the project would have sensitivity to this very sensitive issue and would not insult people by putting a statute of Mr. Mims out there, Joe Beasley, a veteran of the Civil Rights Movement, told Atlanta Progressive News. 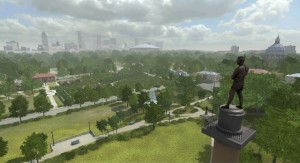 In 2012, the National Monuments Foundation forged an agreement with the City of Atlanta to lease sixteen acres for the purpose of recreating the park. Rodney Mims Cook, Jr., is President of the Atlanta-based National Monuments Foundation, and is the great, great nephew of Livingston Mims. The foundation envisions more than a dozen sculptures of histrionic civil right leaders and other prominent people. Some of the proposed figures include: Dr. Martin Luther King, Jr.; Coretta Scott King; Dorothy Bolden; Ralph David Abernathy; Booker T. Washington; Hosea Williams; Julian Bond; Chief Tomochichi; Rodney Mims Cook, Sr.; and former Mayor Livingston Mims, the confederate officer. There are no objections to Rodney Mims Cook, Sr., being memorialized in the park. Cook served for over twenty years as an Atlanta city alderman and as a member of the Georgia House of Representatives and was an ally of the Civil Right Movement. However, there are a growing number of voices opposing a Livingston Mims statute. “This is the home of Martin Luther King, and we are talking about putting up a monument to honor a guy who wanted to be remembered as a Confederate soldier. The South fought the war not to free slaves, but to continue slavery,” Richard Rose, President of Atlanta chapter of the NAACP (National Association for the Advancement of Colored People), said in a recent WAOK radio broadcast. But there are many advocates, including people living in Vine City, who are willing to compromise on a statute of a Confederate officer in a historic Black neighborhood, in order to get overdue improvements to the neighborhood. The restored Mims Park will cost about fifty million dollars, which will come from several sources including ten million from the National Monuments Foundation, ten million from the City of Atlanta Department of Watershed Management, 2.5 million from Arthur M. Blank Foundation, and about 22.5 million from different philanthropic sources. No money is coming from the Clinton Foundation, as has been rumored. The project will include the memorial statutes, C.T. Vivian’s library, recreational elements for the Vine City community, an urban farm, greenhouses, and a retaining pond system to catch the storm water. The pond project will implement Green Infrastructure to alleviate storm water flooding from Georgia World Congress Center and the new Mercedes-Benz stadium, and is expected to capture an average of 37 million gallons of runoff per year from 150 acres. The storm water runoff, up to the 100 year storm event, will be detained within the pond and slowly released back into the combined sewer overflow (CSO) system, to prevent flooding in the surrounding areas. Currently the Park is a huge green area with nothing on it but trees, in an area with a mixture of well-kept homes; homes in need of repair; and abandoned, boarded up homes. No Negroes! Civil Rights Movement was a sham. This article is full of factual errors. I have sent an email to Mr. Ray to find out what errors he is alleging, but never heard back. I live one block east of the proposed park. I am not in favor of any representation of Livingston Mims or Tomochichi in the park. Tomochichi was a friend to the settlers but a traitor to his own people. The Creek Nation was ultimately forced from the land that Tomochi gave them, which consists mainly of Savannah, Georgia. If you oppose this park because of a statue of Livingston Mims, then you are in favor keeping this area a war zone. Keep do-gooders out so you all can continue the blight and crime without interference. If you disagree with this description of the area, walk around the surrounding neighborhood at night (JP Brawley, Sunset Ave, Griffin St, English Ave, etc.). If you keep doing what you are doing, you’ll get what you’ve always gotten. This property should be returned to the native Indians (first citizens of this land)..